MA English Entrance exams for Delhi University, Jawaharlal Nehru University and Ambedkar University (AUD) are soon approaching in May and June months. Therefore, with this less time you should go through previous year question papers or sample papers. Don’t worry we have your back. 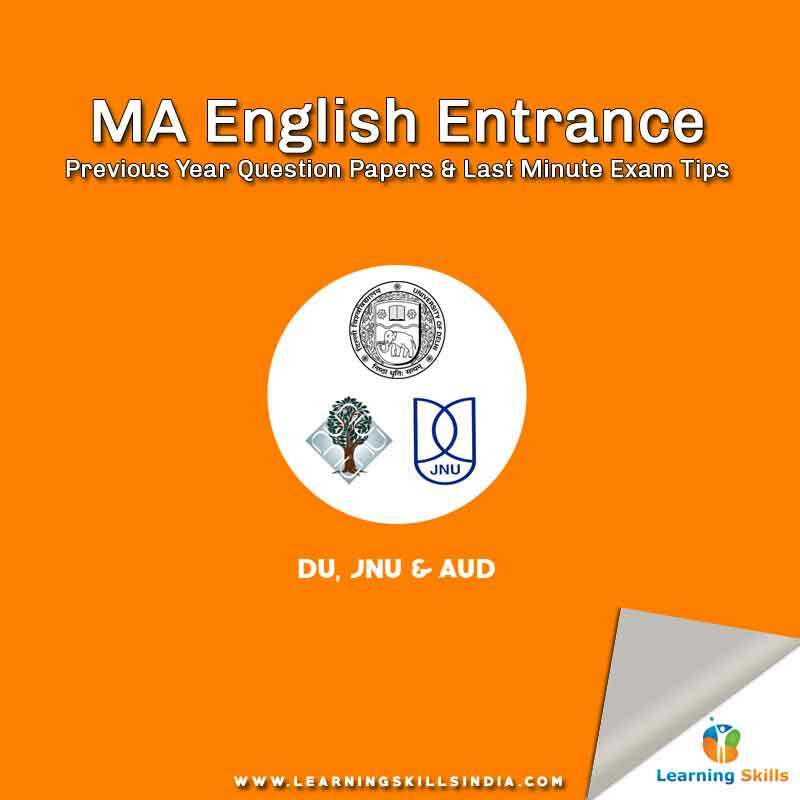 We have compiled MA English Entrance previous year question papers for Delhi University, JNU and AUD. Apart from this, we also have last minute tips for students appearing for the MA English entrance exams. We bring you last minute tips to crack MA English Entrance exams for DU, JNU and AUD in 2017. In May 2017 you already have JNU exam apart from this DU and AUD MA English Entrance exams to take place in the month of June 2017. You may be aggressively preparing for these MA English Entrance exams. However, preparations are incomplete without going through previous year question papers. We have already provided it above. But there’s more you need, a smart recipe to crack it. In recent years, if you check any MA English Entrance exam pattern you will notice there’s much emphasis on Modern, Post Colonial, Contemporary and Post Truth English literature. Therefore, we recommend you to extensively read and research on these topics. Actually, JNU specifically mentions that many questions will be from Indian and Commonwealth English literature. Moreover, DU MA entrance exam also has lot of questions from it. In each MA English Entrance exam, Writing section is the most crucial and strategic. Many students who fails to clear MA English entrance often not able to score in writing part. Therefore, work in this segment. Also, focus on developing critical thinking and writing skills. Many times, there are objective type questions in MA English Entrance from current affairs and general knowledge. As each question is important, you shouldn’t miss scoring on these questions. By following syllabus in chronological manner will help you to mug up important dates, events, movements, and other relevant details. This will help you in both objective and subjective MA English Entrance questions. I am presently a 2nd year student of English honours and I want to persue the masters degree in this field from top universities such as DU and JNU so how should i start preparing from now? As I am not from Delhi I cannot take admission in any of the coaching there so please it’s a humble request to you to give your precious suggestions..
Sir, I am now 3rd year student of English honours from guwahati university.I want to get admission of pg in DU.Can I apply for M.A English in DU and what should I do to get admission in DU? Please provide me the syllabus, book list and previous years question papers for the MA entrance examination. If you’ve more questions please contact our counselor on +91 8750081919. I’m pursuing my B.Sc, I want to do MA English after that. I know JNU allows it. But can you please inform me if DU and AU allows MA English after Any bachelor degree as well? Yes, for both DU and AU’s MA English minimum eligibility criteria is any bachelor’s degree from a UGC recognized university. Sir, I’m pursuing my 3rd year in English hons this year. I want to sit for the MA entrance exams in DU, and some other universities in 2019. Please give me the study table that I can follow beside my 3rd year preparation to complete the entrance preparation as well.